Just A Scrappin' Challenge Jan.24, 2013 Build a Snowman! Make a card, LO or project with a snowmen using buttons and ribbon. I used these cuts from Art Philosophy Tag page 32 at 4", <snwflke3>, snwflke3 layer , <snwflke1> , snwflke1 layer all at 2" & 3". Old stamp on hand of snowman, ink Stampin' Up! Basic Black, Stickles in Crystal & Gunmetal, ribbon Best Value Organdy., paint Making Memories Scrapbook colors Spotlight, buttons from stash. 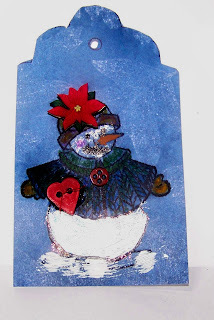 I took the stamped snowman and painted the snow & parts of her after drying I added Stickles to snow for sparkle. I used Gunmetal Stickles for eyes and mouth, buttons for hat, heart on pocket and top of cape. 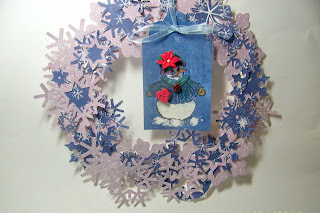 Put the ribbon thru the tag and hung it from the snowflake wreath.